I was never a fan of fake tan, not because it is something that does not please me but simply because I never needed it. While all my life I lived in Portugal, I always had quite a natural, bronzed skin with a beautiful glow. The weather in Madeira Island is always lovely, the summers are long and warm and therefore, fake tan was something I would never reach for. Then I moved to the UK and as the time was passing by, my skin would go lighter until the point were I had to choose the lightest foundation shade. Although I did adapt to my new skin tone, it was never something I was 100% comfortable with and so, after three years of living in the UK and being as fair as I could be, I welcomed fake tan in my life. As I never tried anything like this, I did not know which one to go for. I wanted something affordable, easy to apply and that would give me a natural, glowing tan without looking too orange. 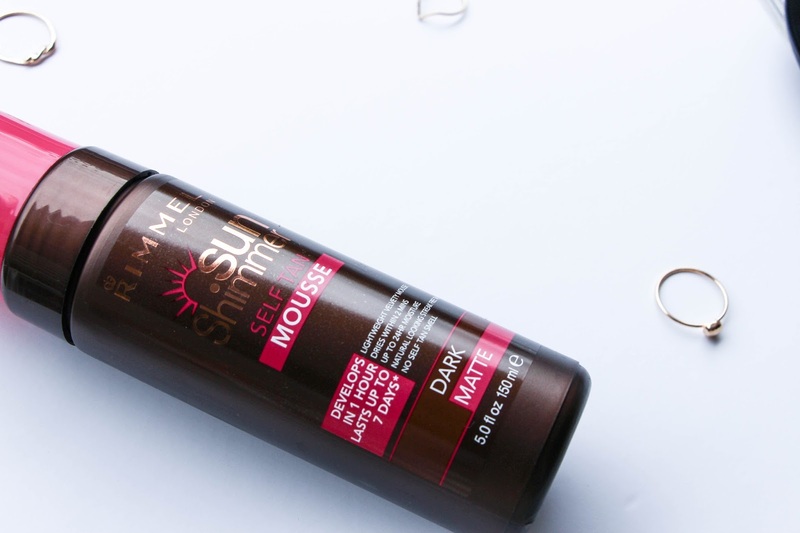 After reading a few blogs and reviews, I decided to go for the Rimmel London Sun Shimmer Self Tan Mousse. At first, I purchased the shade Medium Matte. Being quite fair I did not want to go all the way and look like I rolled in mud. The medium shade is so, so natural and, to me, barely noticeable and so I had to purchase the Dark Matte shade and here are my thoughts on this product. 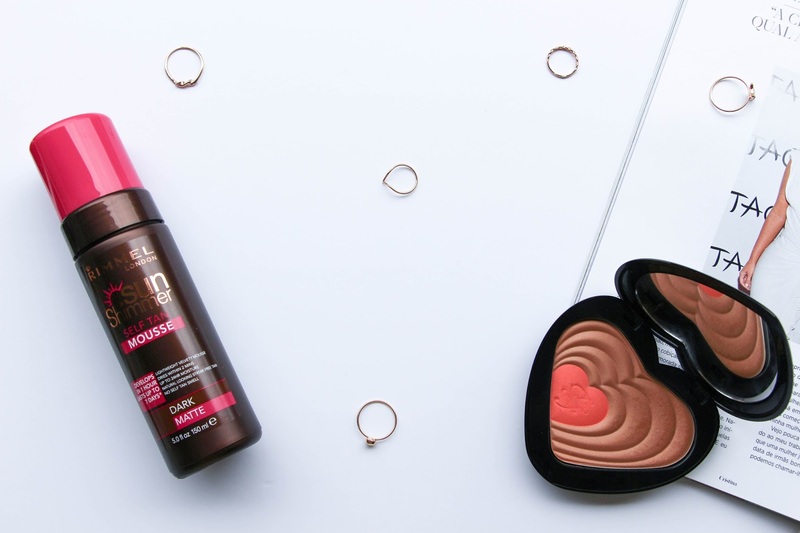 Rimmel London Sun Shimmer Self Tan Mousse is available in three shades: light, medium and dark, all of them with a matte finish. To apply this, I also bought a self-tan applicator mitt as it will make your life easier and it just blends the product on to your skin evenly. For my first time I used the shade Medium Matte and with the mitt I applied the product using circular motions and it worked quite well. Although this product dries quite fast, the application is not that difficult when using the medium shade. Yet, with the darkest shade, the same did not happen. If it your are a fake tan newbie like me, the dark matte will give you a lot of trouble as I feel like it dries much faster and so it can easily leave an uneven application. The trick is to apply it as quick as you can so it is all a matter of practice. The dark shade is also very natural and not as dark as you would imagine. It gives you a nice tan that people will notice and not for bad reasons! I had a lot of compliments when I first went to work after applying this. This is a self-tan mousse that claims to develop in an hour and lasts up to 7 days. I have tried this product in a few different ways and I have to say that although one hour is enough and does develop the tan, leaving it over the night and showering the next morning will definitely give you the best results and will also make the tan last much longer. I quite like the finish of this as it is very natural and although it is matte, it does give a nice sun kissed glow to your skin. To maintain your tan and also increase the durability, it is essential to moisturize your skin. I would not go as far as it lasts for 7 days because I do think that it fades quickly, but they do advise do apply it once a week for a long lasting tan up to three weeks and with that I agree. I have to say that apart from the fact that it does dry quite fast making the application a bit more difficult, I do love this self-tan mousse. Great formula, quick application, amazing finish and no fake tan smell. Have you ever tired this product or what do you have any other fake tan that you would recommend?